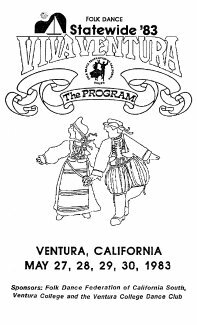 It was back to the seashore for the 38th Annual Statewide Festival, "Viva Ventura,' at Ventura by the sea, May 27, 28, 29, and 30, 1983. The Pre-Party Friday night was held at the Knights of Columbus Hall with the Institute Saturday afternoon moving to the Ventura College along with the evening Festival, also the Sunday afternoon and evening After Parties. The Sunday morning Installation Brunch, Marshall Cates, Chairperson, took place at the Loma Vista School. All these facilities have been excellent. Past President, Avis Tarvin, was Mistress of Ceremonies, introducing Presidents Lila Aurich of the South and Burt Sholin of the North. Past Presidents Bill D'Alvy and Dave Slater installed the incoming officers. There was no pinning of Past Presidents as both Lila and Burt will serve an additonal term as president. The Concert Sunday afternoon from 1:00 p.m. till 3:00 p.m. took place at Ventura High School Auditorium. It was well attended and as usual the performances were exceptional. The Past Presidents once again had a get-together for a couple of hours, talking over old times. My pictures indicate that while we may have lost a step or two in our dancing, we put up quite a front at a party! A good many of us stayed over Monday for the Picnic and Barbecue at Arroyo Verde Park. It was a very pretty place and the food was excellent. There have been several Festivals in smaller cities away from the metropolitan areas and folks seem to enjoy them. Not that there is anything wrong with the Festivals in the large cities, but we see each other more often when it's not so crowded. We want to recognize a few of the Committee people not previously mentioned with thanks to Chairperson Walt Metcalf and Co-Chairperson Alex Sheydayl; Institute, Maria Reisch; Program, Dave Slater; Masters of Ceremonies and Callers, Valerie Staigh; Sound, Ed Feldman; Publicity, Pearl Bleadon; Decorations, Bunny Hogan; Registration, Fran Slater; and many more who contributed. The 1984 Festival is scheduled for Sacramento and we are looking forward to it. It's a year away but time goes so fast. Otherwise I wouldn't be writing about the 39th Annual Statewide Festival following this, the 38th. 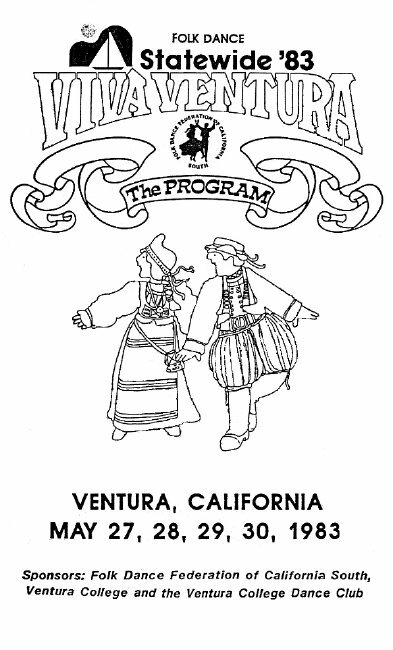 You will note on the program's cover the small new logo of the Folk Dance Federation of California, South. That was designed by Walt Metcalf.